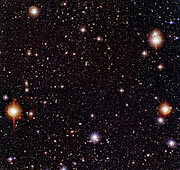 The combined efforts of three European teams of astronomers, targeting the same sky field in the southern constellation Fornax (The Oven) have enabled them to construct a very deep, true-colour image - opening an exceptionally clear view towards the distant universe. The image ( PR Photo 02a/03 ) covers an area somewhat larger than the full moon. It displays more than 100,000 galaxies, several thousand stars and hundreds of quasars. It is based on images with a total exposure time of nearly 50 hours, collected under good observing conditions with the Wide Field Imager (WFI) on the MPG/ESO 2.2m telescope at the ESO La Silla Observatory (Chile) - many of them extracted from the ESO Science Data Archive. 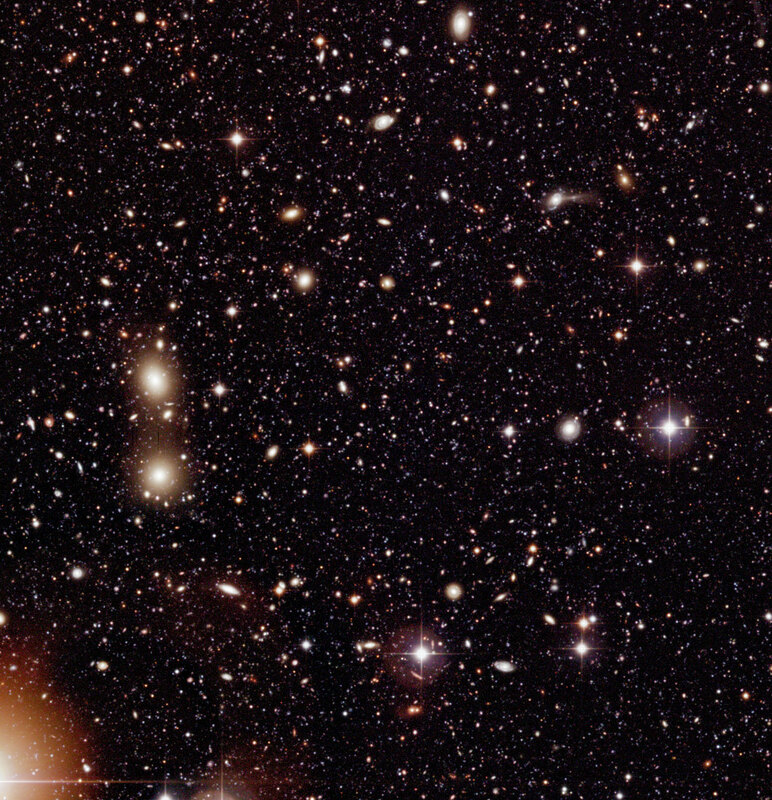 The position of this southern sky field was chosen by Riccardo Giacconi (Nobel Laureate in Physics 2002) at a time when he was Director General of ESO, together with Piero Rosati (ESO). It was selected as a sky region towards which the NASA Chandra X-ray satellite observatory, launched in July 1999, would be pointed while carrying out a very long exposure (lasting a total of 1 million seconds, or 278 hours) in order to detect the faintest possible X-ray sources. The field is now known as the Chandra Deep Field South (CDF-S) . The new WFI photo of CDF-S does not reach quite as deep as the available images of the "Hubble Deep Fields" (HDF-N in the northern and HDF-S in the southern sky, but the field-of-view is about 200 times larger. 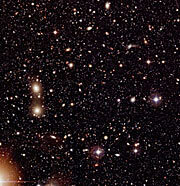 The present image displays about 50 times more galaxies than the HDF images, and therefore provides a more representative view of the universe . The WFI CDF-S image will now form a most useful basis for the very extensive and systematic census of the population of distant galaxies and quasars, allowing at once a detailed study of all evolutionary stages of the universe since it was about 2 billion years old . These investigations have started and are expected to provide information about the evolution of galaxies in unprecedented detail. They will offer insights into the history of star formation and how the internal structure of galaxies changes with time and, not least, throw light on how these two evolutionary aspects are interconnected. 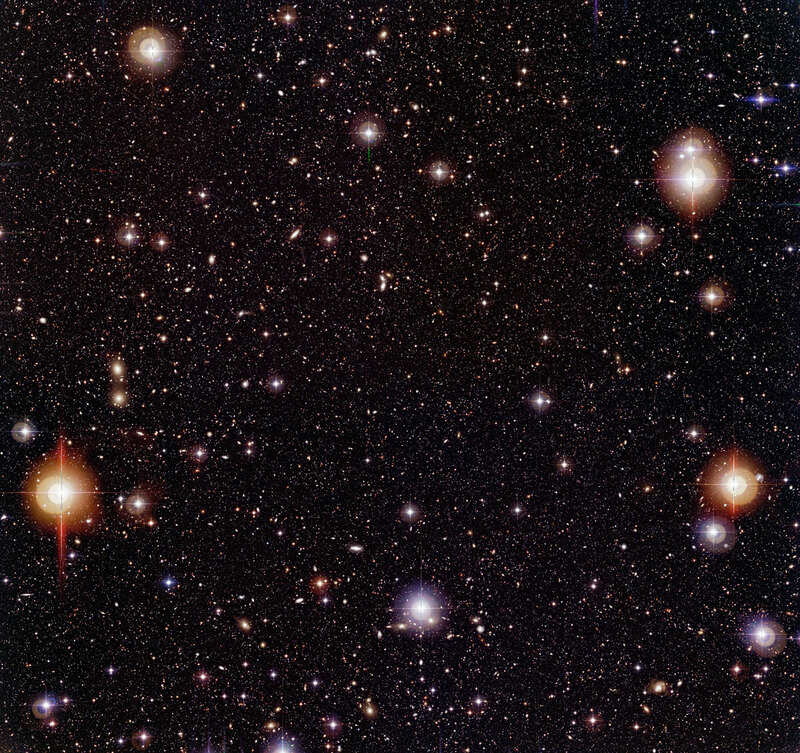 The WFI CDF-S colour image - of which the full field is shown in ESO Press Photo eso0302a - was constructed from all available observations in the optical B-,V- and R-bands obtained under good conditions with the Wide Field Imager (WFI) on the 2.2-m MPG/ESO telescope at the ESO La Silla Observatory (Chile), and now stored in the ESO Science Data Archive. It is the "deepest" image ever taken with this instrument. It covers a sky field measuring 36 x 34 arcmin 2, i.e., an area somewhat larger than that of the full moon. The observations were collected during a period of nearly four years, beginning in January 1999 when the WFI instrument was first installed and ending in October 2002. Altogether, nearly 50 hours of exposure were collected in the three filters combined here, cf. the technical information below. 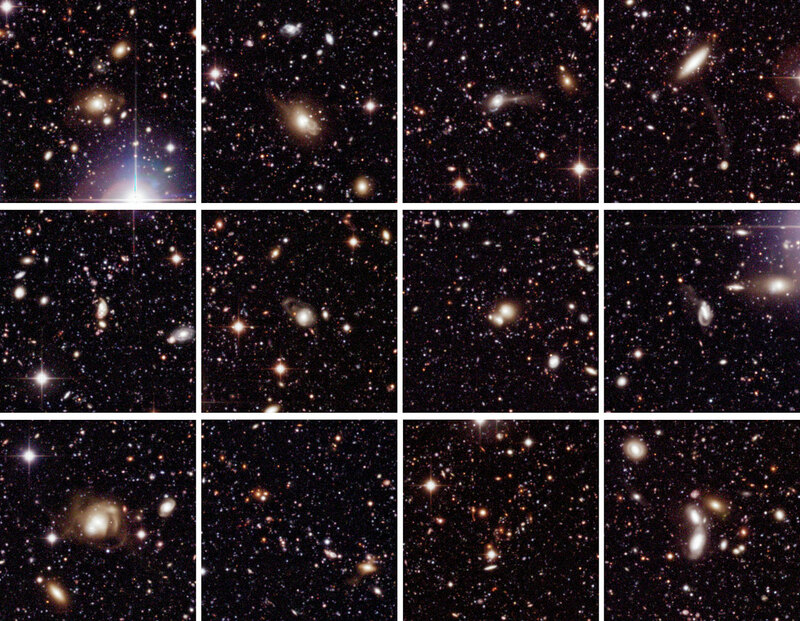 Although it is possible to identify more than 100,000 galaxies in the image - some of which are shown in ESO Press Photo eso0302b - it is still remarkably "empty" by astronomical standards. Even the brightest stars in the field (of visual magnitude 9) can hardly be seen by human observers with binoculars. 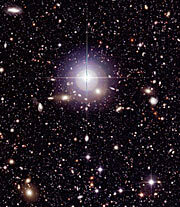 In fact, the area density of bright, nearby galaxies is only half of what it is in "normal" sky fields. Comparatively empty fields like this one provide an unsually clear view towards the distant regions in the universe and thus open a window towards the earliest cosmic times . Astronomers from different teams and disciplines have been quick to join forces in a world-wide co-ordinated effort around the Chandra Deep Field South. Observations of this area are now being performed by some of the most powerful astronomical facilities and instruments. They include space-based X-ray and infrared observations by the ESA XMM-Newton , the NASA CHANDRA , Hubble Space Telescope (HST) and soon SIRTF (scheduled for launch in a few months), as well as imaging and spectroscopical observations in the infrared and optical part of the spectrum by telescopes at the ground-based observatories of ESO (La Silla and Paranal) and NOAO (Kitt Peak and Tololo). A huge database is currently being created that will help to analyse the evolution of galaxies in all currently feasible respects. All participating teams have agreed to make their data on this field publicly available, thus providing the world-wide astronomical community with a unique opportunity to perform competitive research, joining forces within this vast scientific project. COMBO-17 (Classifying Objects by Medium-Band Observations in 17 filters) : an international collaboration led by Christian Wolf and other scientists at the Max-Planck-Institut für Astronomie (MPIA, Heidelberg, Germany). 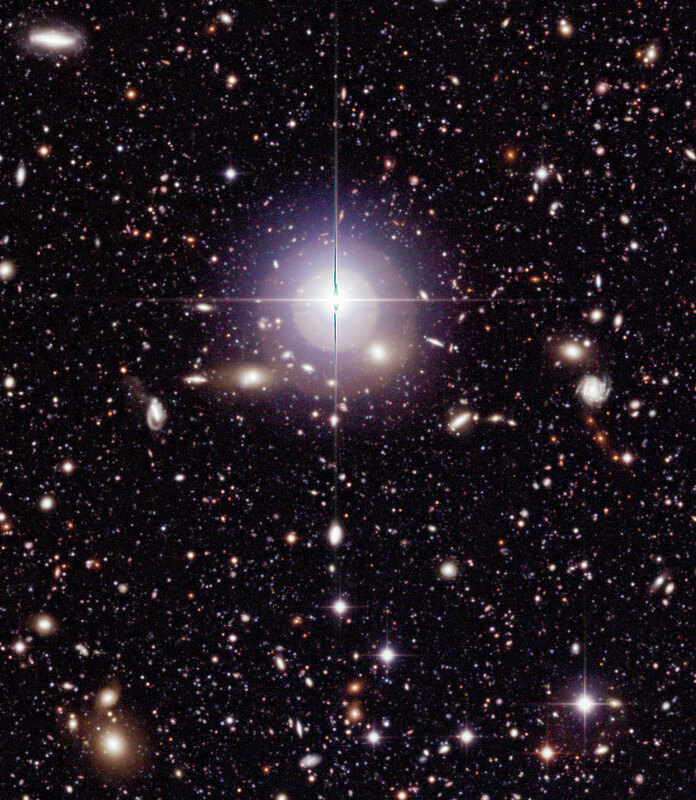 This team used 51 hours of WFI observing time to obtain images through five broad-band and twelve medium-band optical filters in the visual spectral region in order to measure the distances (by means of "photometric redshifts") and star-formation rates of about 10,000 galaxies, thereby also revealing their evolutionary status. EIS (ESO Imaging Survey) : a team of visiting astronomers from the ESO community and beyond, led by Luiz da Costa (ESO). They observed the CDF-S for 44 hours in six optical bands with the WFI camera on the MPG/ESO 2.2-m telescope and 28 hours in two near-infrared bands with the SOFI instrument at the ESO 3.5-m New Technology Telescope (NTT) , both at La Silla. These observations form part of the Deep Public Imaging Survey that covers a total sky area of 3 square degrees. GOODS (The Great Observatories Origins Deep Survey) : another international team (on the ESO side, led by Catherine Cesarsky ) that focusses on the coordination of deep space- and ground-based observations on a smaller, central area of the CDF-S in order to image the galaxies in many differerent spectral wavebands, from X-rays to radio. 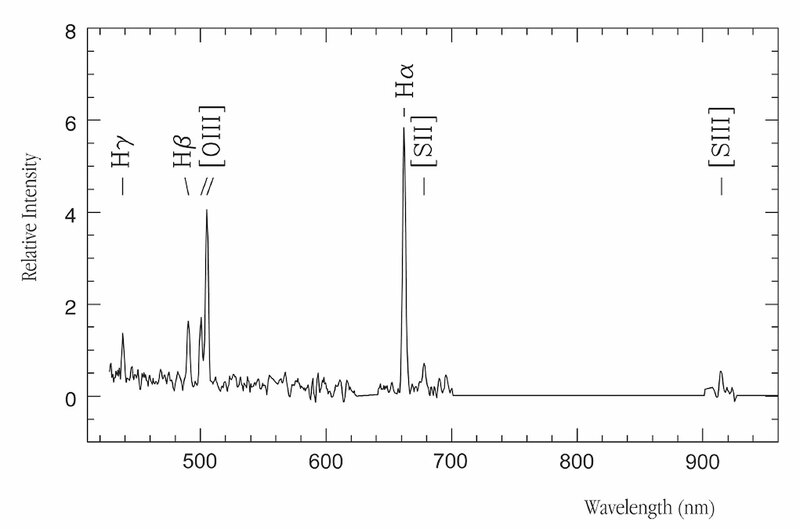 GOODS has contributed with 40 hours of WFI time for observations in three broad-band filters that were designed for the selection of targets to be spectroscopically observed with the ESO Very Large Telescope (VLT) at the Paranal Observatory (Chile), for which over 200 hours of observations are planned. About 10,000 galaxies will be spectroscopically observed in order to determine their redshift (distance), star formation rate, etc. Another important contribution to this large research undertaking will come from the GEMS project. This is a "HST treasury programme" (with Hans-Walter Rix from MPIA as Principal Investigator) which observes the 10,000 galaxies identified in COMBO-17 - and eventually the entire WFI-field with HST - to show the evolution of their shapes with time. How and when was the first generation of stars born? When exactly was the neutral hydrogen in the universe ionized the first time by powerful radiation emitted from the first stars and active galactic nuclei? How did galaxies and groups of galaxies evolve during the past 13 billion years? What is the true nature of those elusive objects that are only seen at the infrared and submillimetre wavelengths? Which fraction of galaxies had an "active" nucleus (probably with a black hole at the centre) in their past, and how long did this phase last? How many variable sources are seen and what are their types and properties? How many supernovae are detected per time interval, i.e. what is the supernovae frequency at different cosmic epochs? How do those processes depend on each other? This is just a short and very incomplete list of questions astronomers world-wide will address using all the complementary observations. No doubt that the coming studies of the Chandra Deep Field South - with this and other data - will be most exciting and instructive! Other wide-field images from the WFI have been published in various ESO press releases during the past four years - they are also available at the WFI Photo Gallery . A collection of full-resolution files (TIFF-format) is available on a WFI CD-ROM .